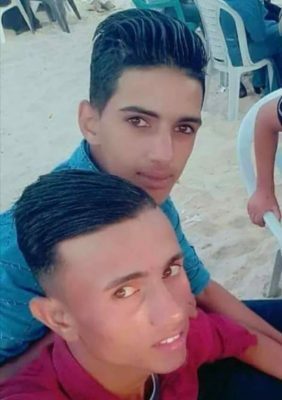 Updated: The Palestinian Health Ministry in Gaza has reported, late on Monday at night, that an Israeli war jet fired a missile at Palestinians, east of Khan Younis, in the southern part of the Gaza Strip, killing two young men. They have been identified as Naji Jamil Abu ‘Aasi, 18, and his cousin, Ala Ziad Abu ‘Aasi, 21. The Health Ministry stated that the medics managed to reach the two Palestinians, near the perimeter fence in southern Gaza, and took them to Nasser Medical Center. Israeli sources said the Israeli Air Force targeted Palestinians, who reportedly approached the fence, and placed an explosive object. It is worth mentioning that the soldiers also fired dozens of live rounds, and flares, at Palestinian protesters, east of Rafah, and in Khuza’a town, east of Khan Younis, in southern Gaza. In related news, several Palestinians managed to reach an Israeli army sniper post, across the border fence, and burnt it, while a number of fighters fired live rounds at an Israeli drone, east of Khuza’a.